A modern cut Titanium ring with heavily chamfered edges, in the centre lies a single brilliant cut white Diamond measuring 1.7mm in diameter (0.02ct). The remaining central band had a satin brushed, the shoulders and inside are highly polished. 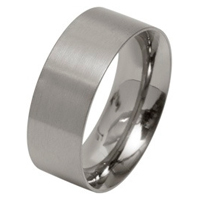 The ring measures 6mm wide and has a slightly rounded inside for comfortable everyday wear.